An annual that may reach as much as 6 feet in height with bluish-green leaves and stems that emit a milky sap when cut. 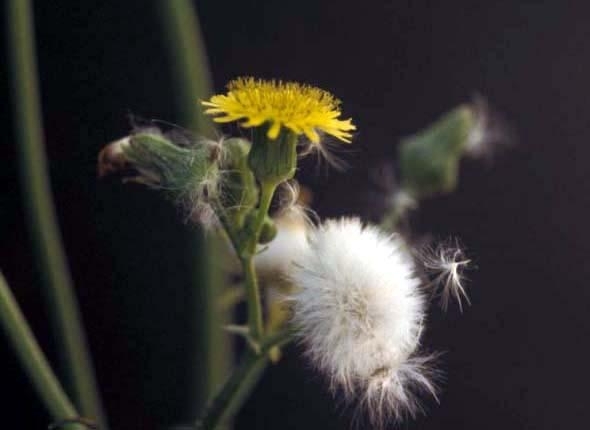 Spiny sowthistle is primarily a weed of landscapes, winter small grains, pastures, hay fields, orchards, and roadsides. It is found throughout the United States. Cotyledons are egg-shaped, approximately 3 to 8 mm long, and occur on petioles. 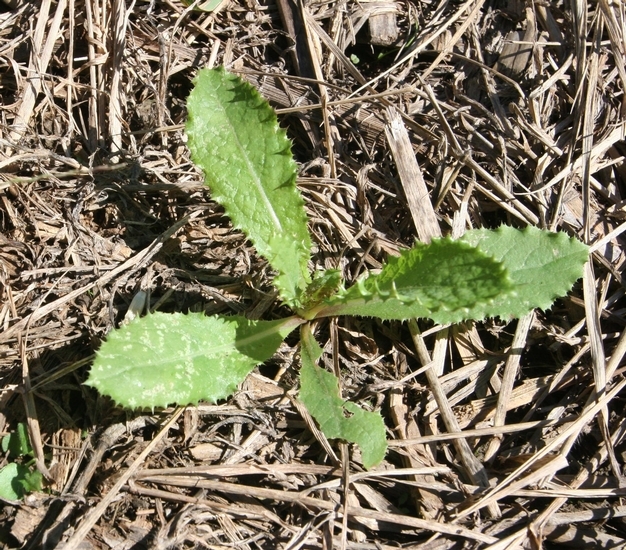 Young leaves form a basal rosette. 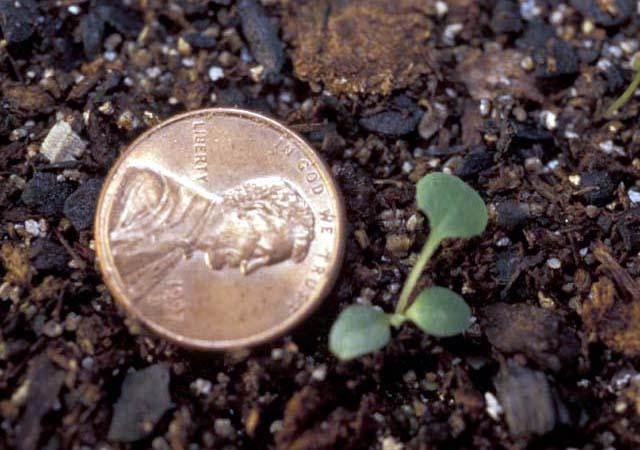 Both young leaves and cotyledons have a whitish coating. 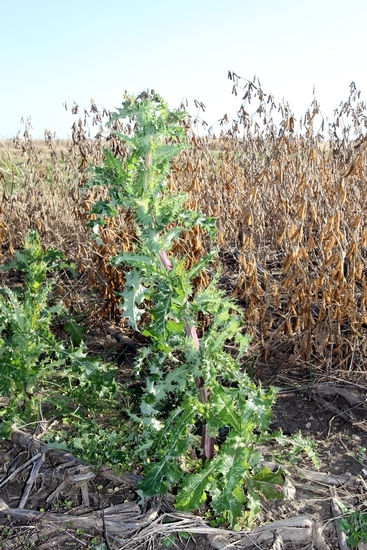 Leaves initially develop as a basal rosette and for this reason are often confused with thistles. All of the leaves are deeply cut with two rows of lateral appendages (pinnatifid), and range from 2 1/2 to 12 inches in length and 1/2 to 6 inches in width. Leaves are generally hairless (glabrous), egg-shaped in outline and have prickly margins. Leaves that occur on the flowering stem are are alternate and have rounded lobes that clasp the stem. Leaves emit a milky sap when broken. Unbranched, erect, reaching as much as 6 feet in height but generally around 2-3 feet in height. Stems emit a milky sap when broken. Occur in clusters at the ends of stems. 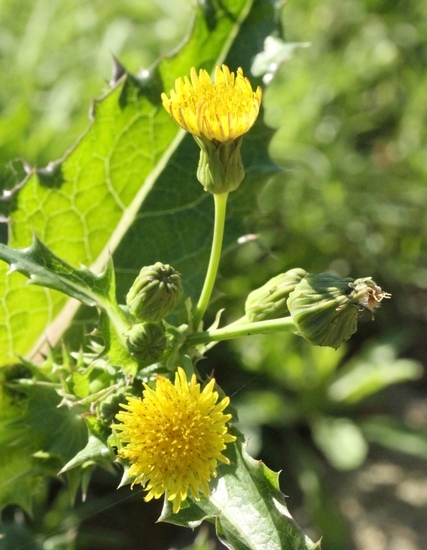 Individual flowers range from 1/2 to 1 inch in diameter and are yellow in color. A brown, wrinkled achene approximately 4 mm long. 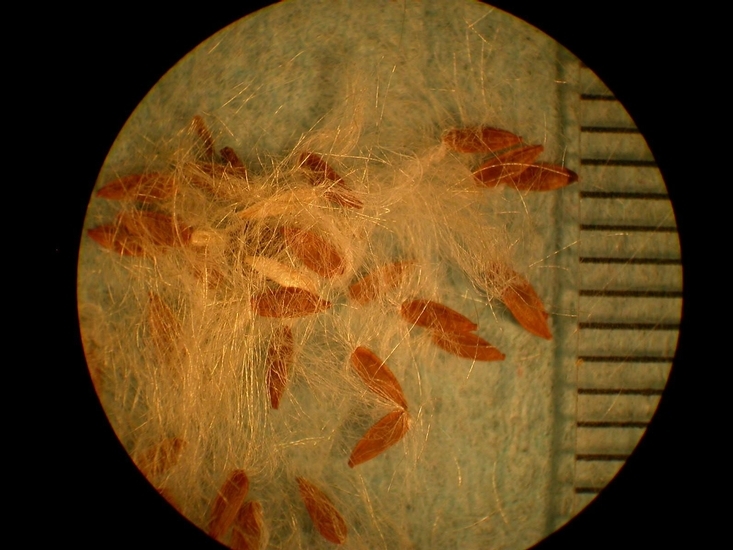 Mature seed have a white feathery pappus that collectively form a white "puff ball" similar to that of dandelion. 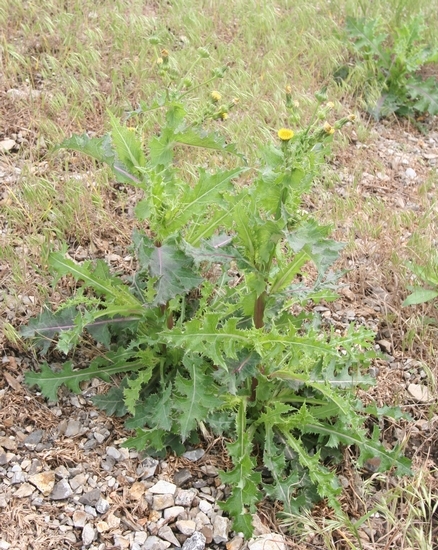 The leaves with very prickly margins that initially develop as a basal rosette and then occur alternately along the flowering stem, the bluish-green color of the leaves, and the yellow flowers with a puff-ball seedhead are all characteristics that help in the identification of spiny sowthistle. 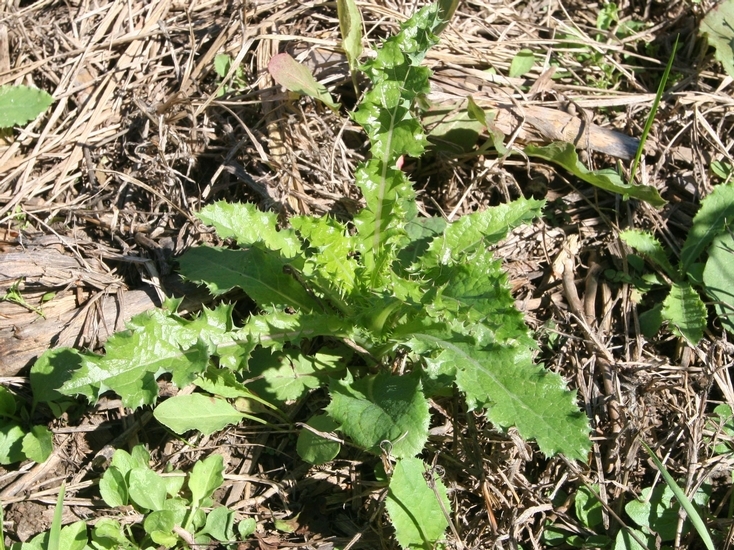 Annual Sowthistle (Sonchus oleraceus) is very similar in appearance, however this species has distinctly pointed lobes that clasp the stem whereas spiny sowthistle has rounded lobes. 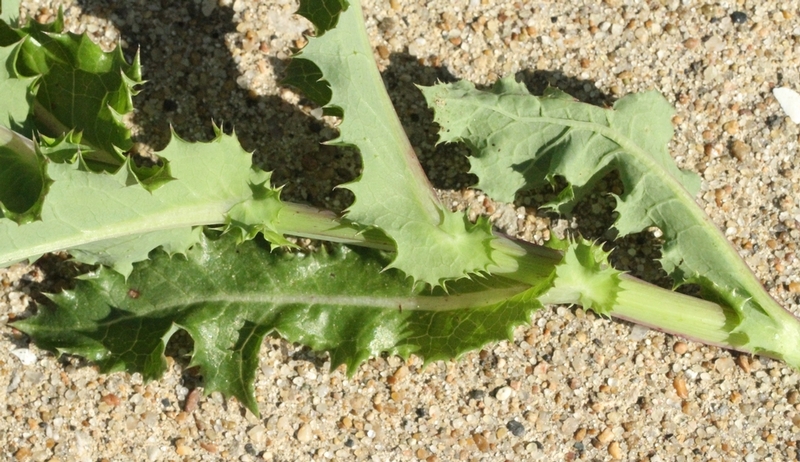 Also, the leaf margins of annual sowthistle are much less spiny or prickly than those of spiny sowthistle. Both of the sowthistles can be distinguished from true thistles by the milky sap they emit when broken. 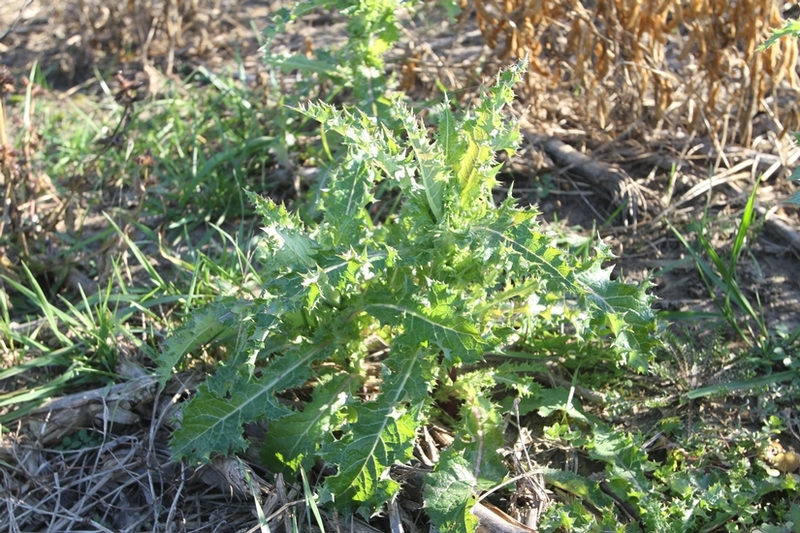 The sowthistles might also be confused with Prickly Lettuce (Lactuca serriola), however the midvein on the leaf undersides of this weed has distinct spines or prickles, whereas those of the sowthistles do not.